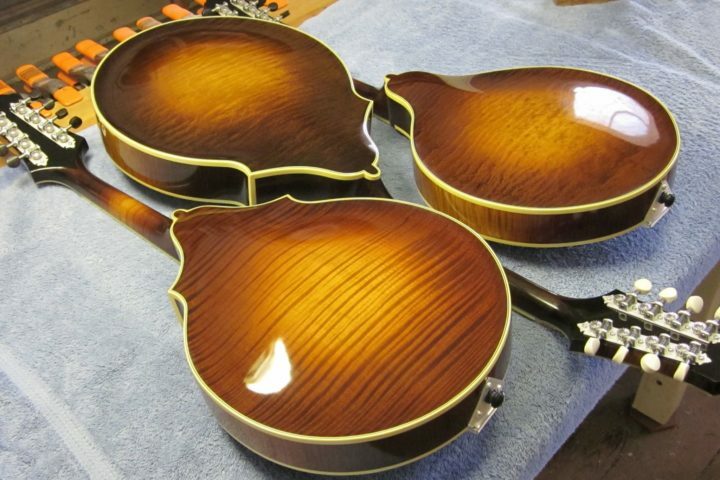 Like so many Canadian luthiers, David Wren honed his craft working under guitarmaking legend Jean-Claude Larrivée. In 1977, he opened his own shop and established himself as one of North America’s best guitarmakers. But in 1990, Wren left the world of building to became a partner in Toronto’s 12th Fret music store. 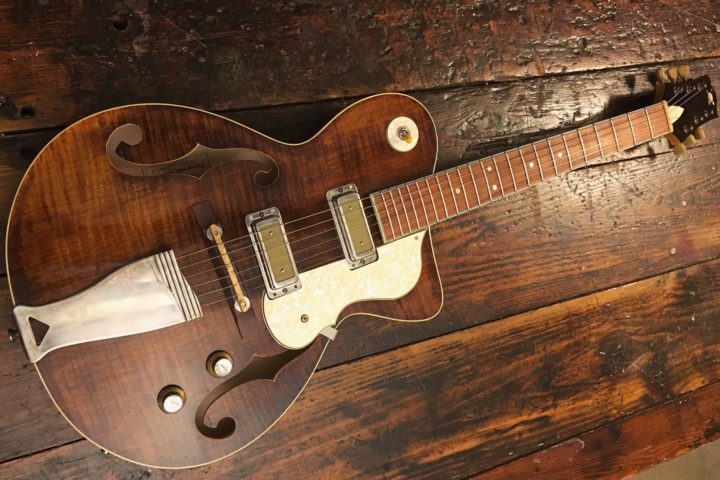 We’re happy that Wren is taking orders once again and we were floored when he told us on the phone about the guitar he’s working on right now – a recreation of an instrument he built for Joan Baez decades ago. 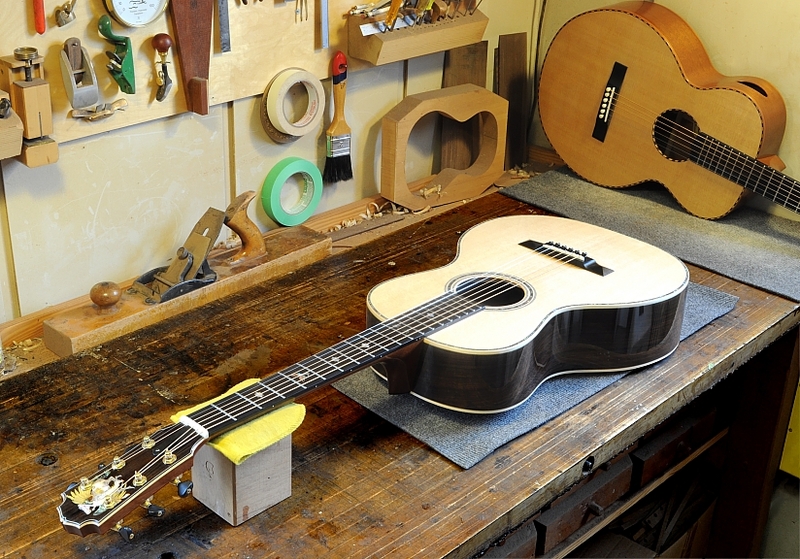 Fretboard Journal: What’s on the bench? David Wren: I just put the strings on a guitar for a guy in France. He ordered it almost two years ago. He wanted a copy of the guitar I made in the late ‛70s or early ‛80s for Joan Baez. I agreed to do it but I didn’t agree to duplicate her inlay work because there were some personal aspects of it that meant something to her. But I got it really close. It was fun because I didn’t have a photograph of the guitar or anything. That’s pre-internet! I tried to go online and Google her, and I came up with a bunch of photos of her playing the guitar. There were all sorts of aspects of it I had totally forgotten about. We got all that figured out, and I put it together and we’re really happy with it. It coincided with another small guitar that I’m making for Mike Francis, who is just an unbelievable guitar player who has played with virtually everybody over the last 40 years. FJ: And what did he order? DW: He wanted a little Nick Lucas sort of body style. 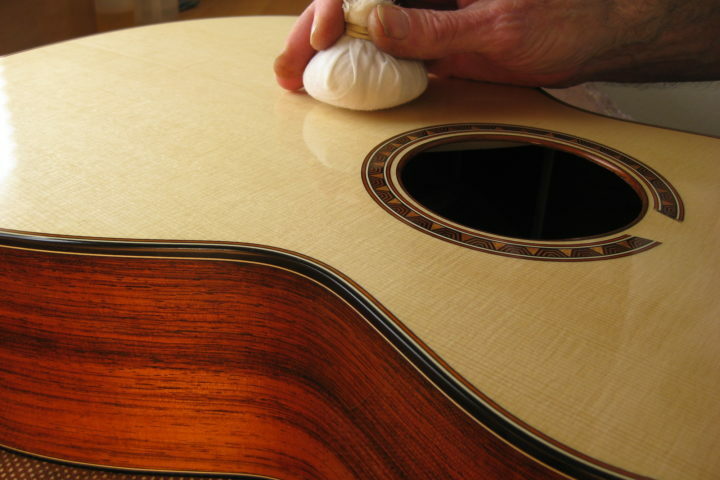 When I got back into guitar building about four years ago, he just called me up and said, “Listen, if you ever want me to do any audio files for your website, I can call in a favor at one of the studios and we’ll do it.” So I said absolutely. At that point, I had three models. I took the three guitars and we met at Inception Sound. He did some fantastic audio files and the small guitar really seemed to like the microphone. He said, “I want one exactly like this, and I want it to sound exactly like this guitar,” but he had some different neck specifications because he’s a small guy. 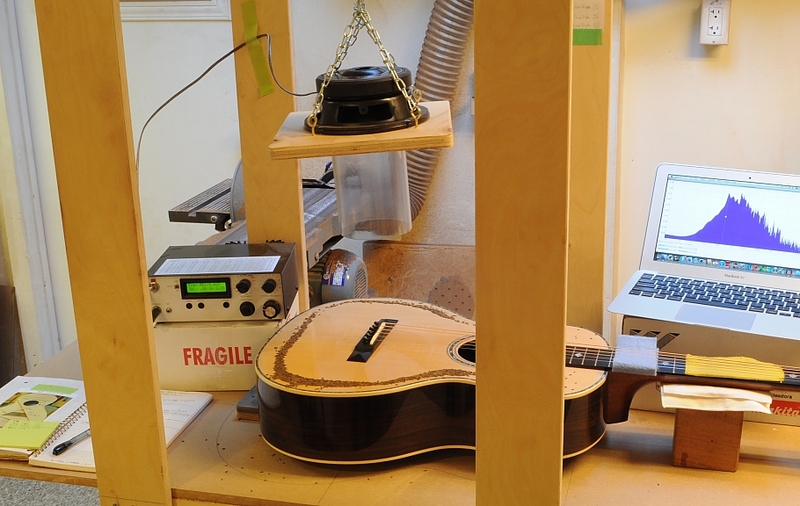 So I have these two smaller guitars that are quite different looking and sounding, but both are on my bench right now. FJ: Let’s talk about the Joan Baez guitar. How did she find you? At that point, I didn’t even own one of my own guitars, so I went to a guitar store that had a couple of mine, grabbed those guitars and took them down to her. She was amazing. I walk in and she said, “Let’s get this out of the way right now. My manager is telling me I should be getting a guitar from you for cheap, for free, or whatever. That’s total crap. You’ve got to make a living. I want to pay full pop for the guitar. So let’s just get that out of the way so we can move on and talk about the details of the guitar.” I thought, you know, that’s pretty nice. She was just so down to earth. None of the guitars I had were exactly what she wanted, ’cause she was used to a little Martin New Yorker. I loaned her a guitar to finish the tour. She gave me all the specs that she wanted and I made that guitar. She played it for over a decade and recorded with it. FJ: What size was it? DW: It was a 12-fret, 0-style. FJ: And what kind of wood? DW: It was a Sitka top, and I believe I used Brazilian. This replica I’m working on now is Indian rosewood with Sitka. FJ: Have you kept in contact with Baez? DW: Not really. Maybe three or four years afterwards, she said, “You know, the action’s a little high, and I took it to a guy and he said there’s no truss rod in the guitar.” At the time most people were using those square, tubular, non-adjustable rods. I said, “Well, there’s a truss rod in there, it’s just the non-adjustable kind like Martin uses.” We would go back and forth on stuff like that. She was always nice to deal with. The other weird thing was about two years after she got that guitar, I get a call. It’s a guy telling me he’s Jackson Browne and asking me about the guitars. I’m thinking it’ a friend of mine screwing me around, you know? But, sure enough, Jackson Browne was over at Joan Baez’s place, played her guitar and he ended up phoning me and we’re back and forth about a guitar for him, too. But I ended up canceling the order because I got offered the partnership in the 12th Fret. I thought I could do guitar building and run the store, but I couldn’t! 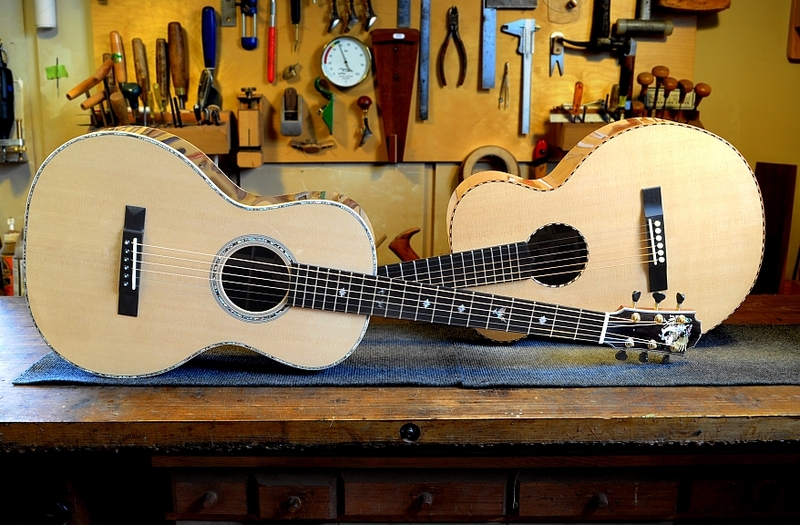 To learn more about David Wren and Wren Guitar Works, visit his site, here.